Two of My Favorite Summer "Gigs!" Now that things are barely settling down a bit, I thought I'd post some photos from a couple of my favorite annual gigs that were last week! My mom and I have been doing this outdoor concert together for the past few years at the Village at Mendota Heights. So far we've always lucked out with great weather! There's a cute grassy "square" outside where all the families gather to listen to children's entertainment. This year there was even a petting zoo! 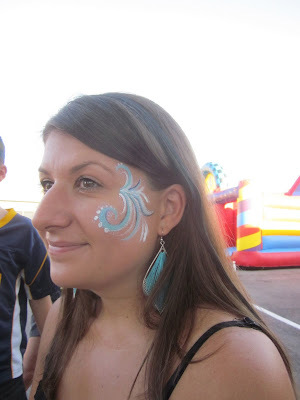 Then the next day I painted at another one of my favorite events to work at...the fall kickoff party at Virtuosos Music Academy in Plymouth! 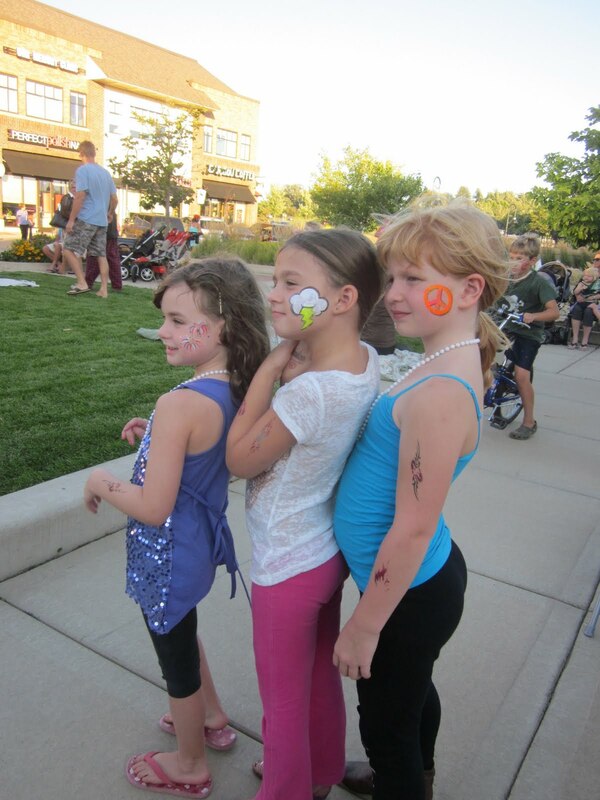 The past few years they've been including some of the other neighboring businesses and the event grows every year. It is free and open to the public with wonderful live music by the students, karate demonstrations from the nearby karate school, and this year they even had free Starbucks, and some professional stylists from The Style Room styling and spraying kids' hair fun colors! 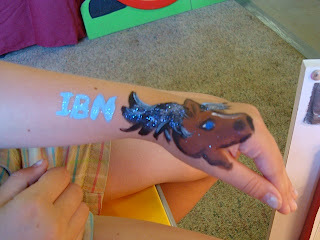 I had just a few minutes to paint my own arm when I started! I love doing the music related designs at this event. My little portable face painting setup. It all folds up and fits in the back of my VW Beetle! A little father son arm painting! 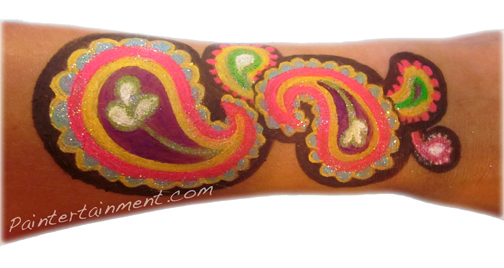 There was a rush of "eye swirls" after everyone saw this one! I love how it matched her earrings! 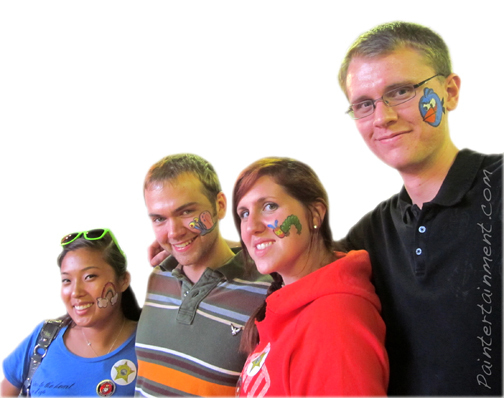 It was a busy end to a busy summer, and I still have more events to paint at this September. Business is booming and I've been having a lot of fun! Before we know it I'll be posting photos of Christmas gigs with Santa...gotta enjoy these summer days as long as we can! 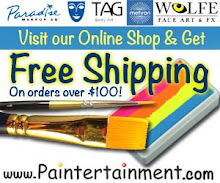 Liquid Bling Now Available on Paintertainment! 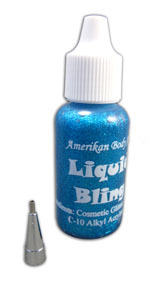 I'm thrilled to announce the arrival of another one of many new products coming to Paintertainment.com: Amerikan Body Art's Liquid Bling! 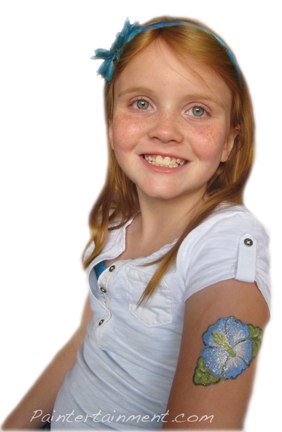 Liquid Bling has become the clear favorite 3-dimensional glitter product of professional face and body artists. Made of a combination of pure aloe and cosmetic grade glitter, Liquid Bling dries with a 3-dimensional effect and is fantastic for adding the look of gems or outlines that really pop! 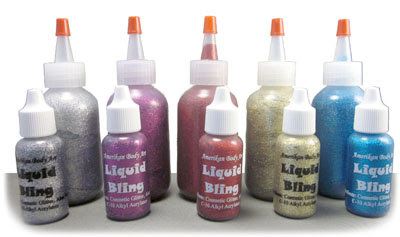 We now carry the 5 most popular colors of Liquid Bling, in both .5 oz bottles and 2 oz refill bottles. The .5 oz bottles are $5.99, and the large 2 oz refill bottles are $9.99. The .5 oz applicator bottles come in a little plastic bag with a metal tip. 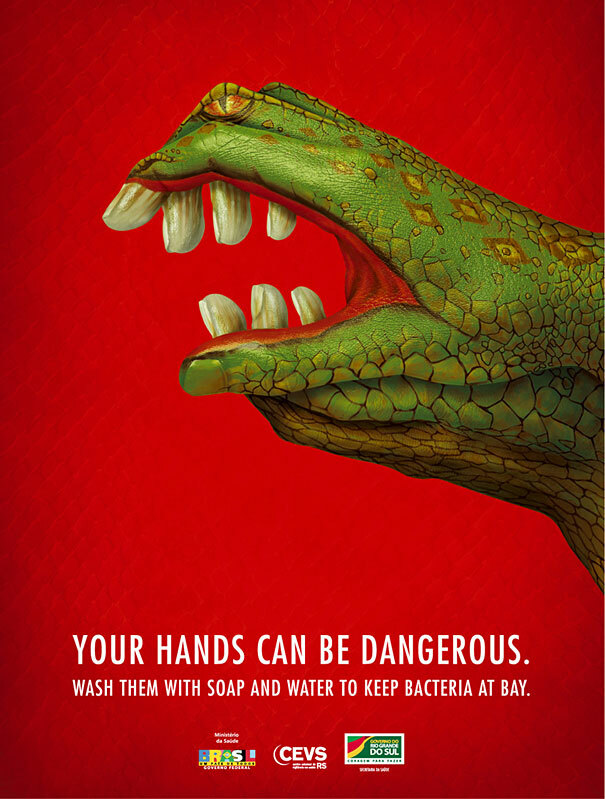 The tip is to be placed on the bottle only during use, and it is recommended that you remove it and wash it between usage, replacing the plastic cap back on the bottle. I have heard from other artists who use this product that it is helpful to keep a pin in the tip (with a large head so it doesn't fall in of course) between customers. 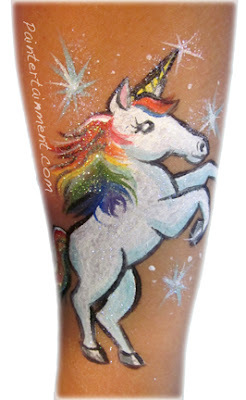 This helps prevent the tip from clogging with glitter. 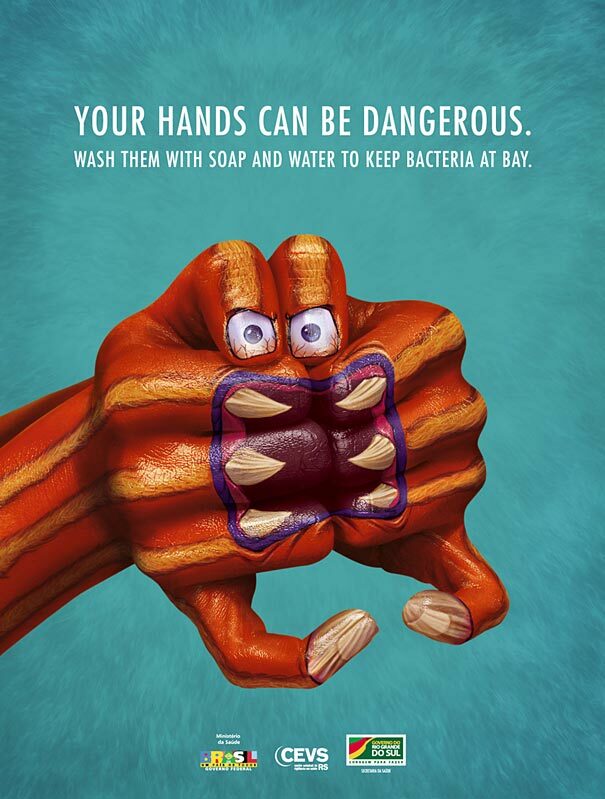 The tip can be soaked in warm water to clean at the end of your day. 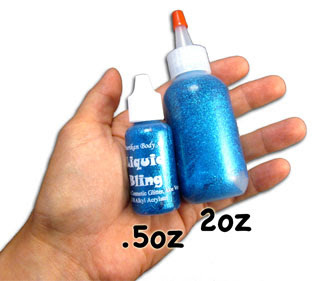 I am super excited to start using this liquid bling, especially in my upcoming Christmas events! Are you a fan of Liquid Bling? If so, I'd love to see and share photos of your work! I hope to post photos of this in use as soon as I have some. Until then, happy bling-ing! 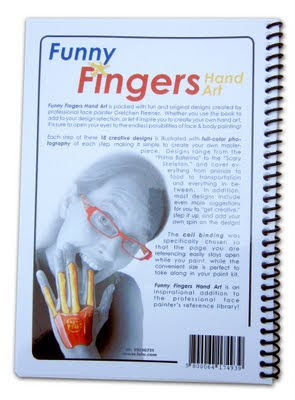 Introducing: "Funny Fingers Hand Art!" I am SUPER excited to announce my latest book, hot off the press! 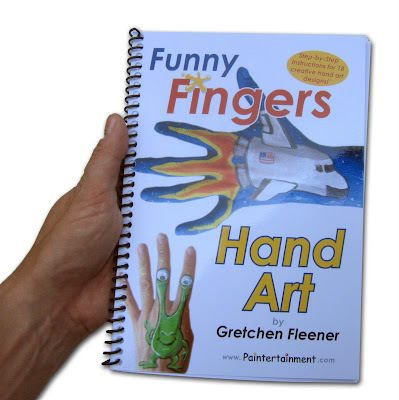 "Funny Fingers Hand Art" It's been 3 years since I've published a book...about how long it's been since my first baby boy started getting mobilized! I think you can guess what's been keeping me busy since! 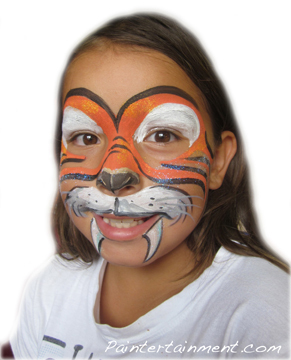 Unlike my previous two books, "Face Painting: A Step-by-Step Guide" and "32 Classic Carnival Designs," this book is not designed for the total beginner. 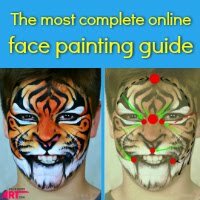 This new book assumes that you have the ability to paint and have some artistic skill as a face painter. It definitely stretches the imagination! 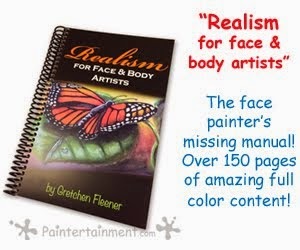 If you're a professional face painter, are finding yourself "stuck" in the same old cheek art designs, and are looking for some fresh, fun, new ideas to get your creative juices flowing, this is the book for you! 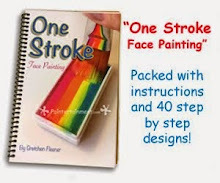 The book measures about 6" wide (including the spiral binding) by 8.5" tall, making it the perfect size: large enough to see each step, but small enough to tuck into your kit of paints and take with you. It costs a little more to bind a book with the spiral binding, which is why you won't find that on the other popular selling books currently out there that focus on princess faces, cat faces, etc. 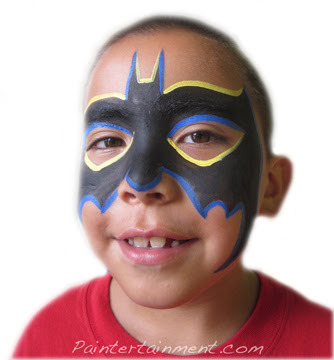 However, being a professional face painter myself and a professional product designer, I know that when you're painting, your hands are both full and you don't want to mess with trying to hold a page open. The spiral binding allows the book to lay flat on the table for reference, or fold completely back if you just want to reference one page. 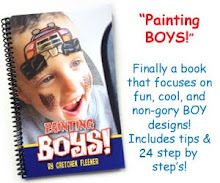 So what's the big deal about painting on hands vs the face? Kids just LOVE them. 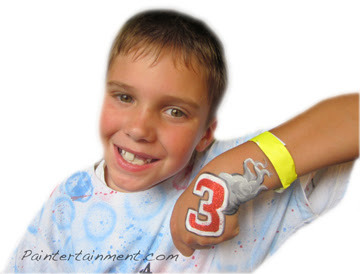 A little creative placement on the hand, combined with a child's imagination, can bring your designs to life! 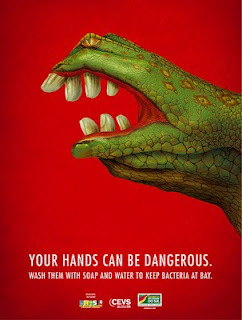 Kids can open and close their fingers to make an animal's mouth open and close, to make legs walk, or to wiggle the fire coming out of the space ship. 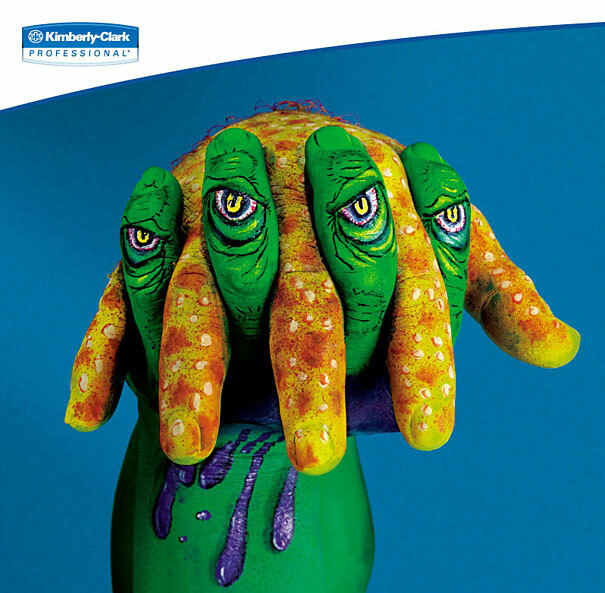 Parents love to see their child's own hand transform into a puppet...a fun toy that they can enjoy all day and won't find broken under their bed two days later! 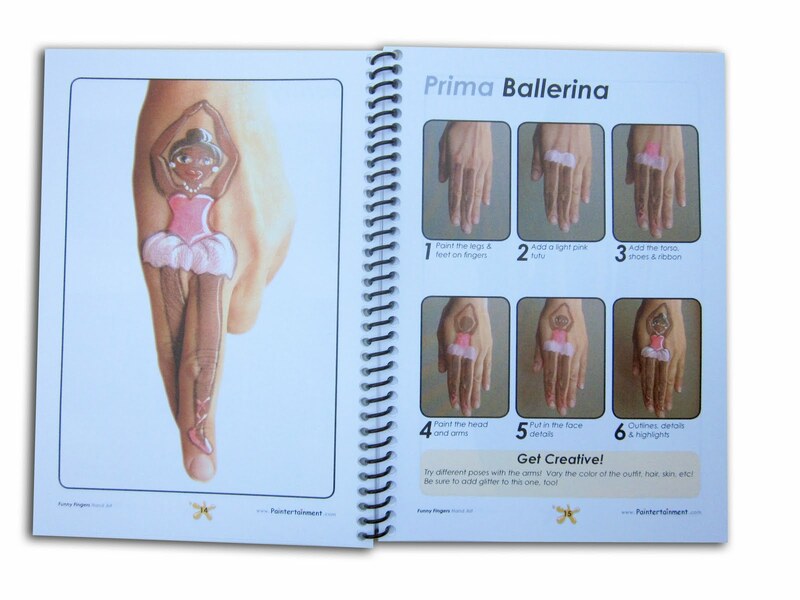 The beginning of the book opens with a couple pages of tools and tips. 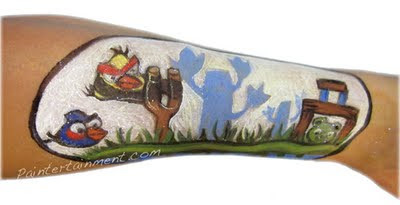 Tips include hand-painting-specific things like how to get a smooth, solid line across a knuckle. 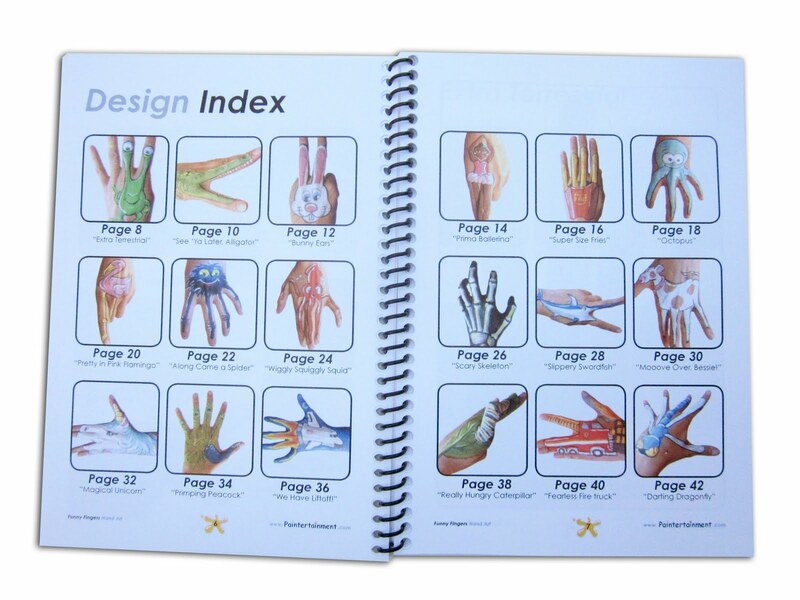 The "Design index" spread functions as a visual table of contents for the designs. 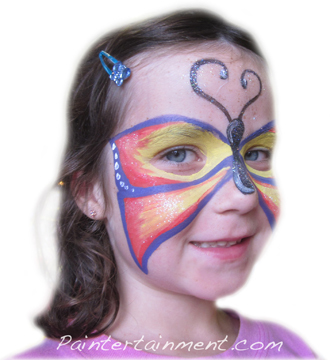 This makes it quick and easy for you to find the page you want, and also can double as a design menu board if you use it at your events for the kids to choose from! 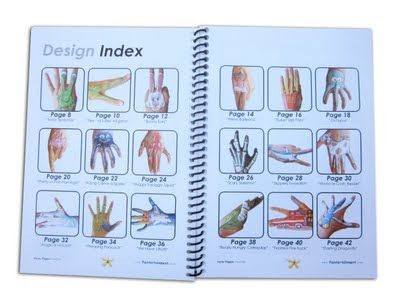 There are 18 designs, each one illustrated with full color photography in six steps, along with a large, full-page photo of the finished design. 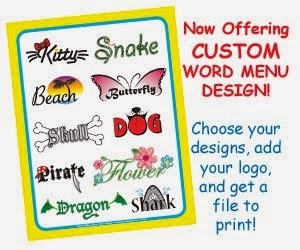 Most of the designs also include the "Get Creative!" box at the bottom, which includes more ideas to make your design unique and inject your own style! You can purchase the book today from my website. 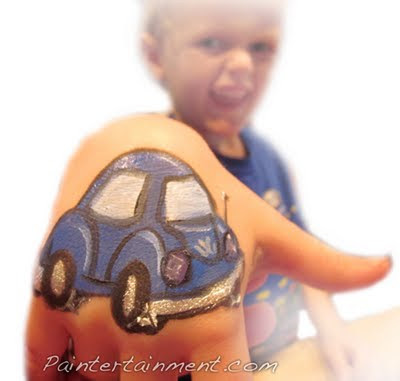 My little 3 and a half year old Sammy is really at the age where he's getting into the face painting. 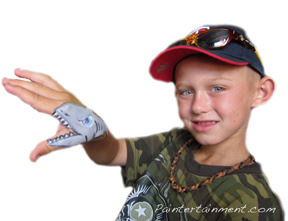 He prefers to have them on his arms, legs, and hands though, so he can see them. Usually when Mommy gets home from a gig, I have one last customer demanding a painting when I walk in the door! For this one he asked for a "Beetle car." It had to be blue, like Thomas, of course, and I used some metallic silver for the bumpers and wheels. He was extremely specific on this one. 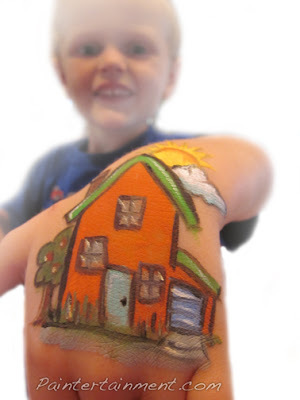 It had to be an orange house with a green roof, a blue garage door, and an apple tree with apples. 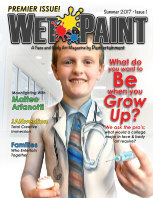 He has a very creative, vivid imagination like his Mommy, and I love helping him realize his "vision!" This is Otis, our dog. 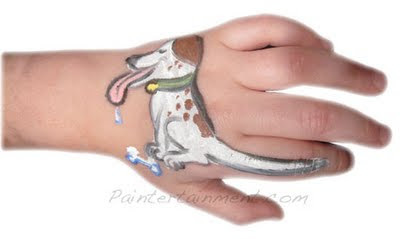 Sammy came up with the idea to make his tail on his finger so that it could be "wagged." This is Amos, our other dog. He had to have his green collar, too. 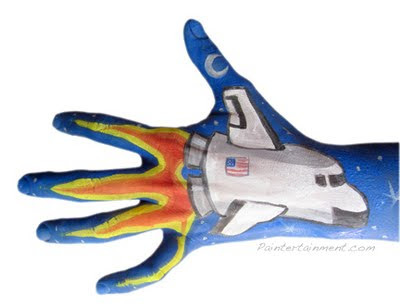 Here are a few more of my hand paintings I just thought I'd share! You can find them on my Facebook page too. This one is actually going to be on the cover of my new book which will be coming out very soon... "Funny Fingers Hand Art!" I'll be sure to blog about it once I have copies in my hands to ship. These two below I just did tonight. 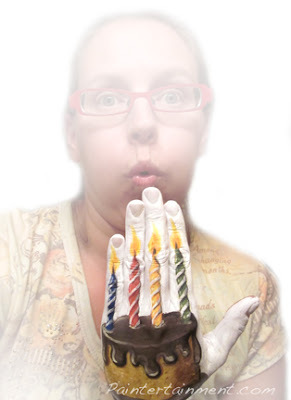 I spent maybe 15 minutes on the marshmallow roasting one and probably 20 or so on the birthday cake. 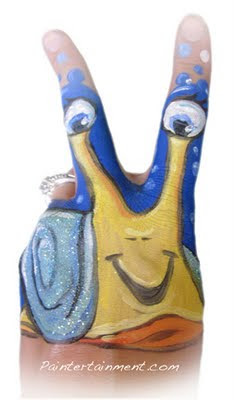 I never get to spend this much time on my very adorable yet often times wiggly little clients, so it's fun to put more time into painting my own hand! My 3.5 year old Sammy thought this one was pretty cool. 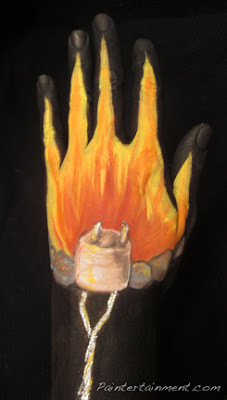 I used some metallic silver paint for the roasting stick and a touch of UV-Day Glow paint in the flames. This is another one I thought of while at the fair but didn't get around to painting...which was fine, because doing it at home after the kids went to bed gave me more time to pay attention to detail. I used metallic again on the platter. Guess I had flames on the brain tonight! Dakota County Fair 2011 Recap! Just yesterday my 14th Dakota County Fair week came to a close! This year I didn't blog as much because I couldn't get the wifi to work there on my laptop. And, by the time I got home at 11:30 pm, I was just too wiped to download, edit, and post pics! But, now that I've had a chance to do that, I thought I'd share a few photos from the week. 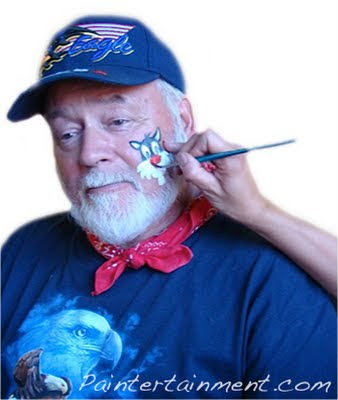 This photo above is me painting my 3.5 year old Sammy. Behind me is my husband Wayde and our littlest, 1.5 year old Toby! My boys came along for the booth set-up and tear-down. 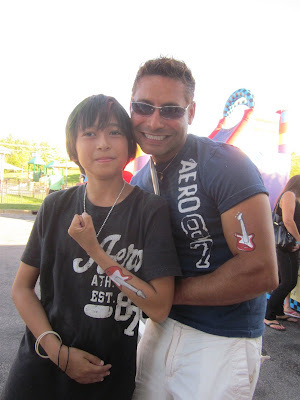 I couldn't do the fair without my husband, who takes care of the boys while I'm there and is always super supportive of my business ventures! 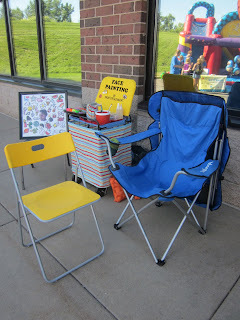 Also my mom, who took this photo, and splits up the days painting at the booth too, and my dad, who was a big help with tear-down night this year! 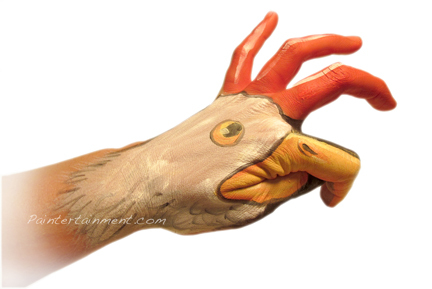 The chicken was really fun! 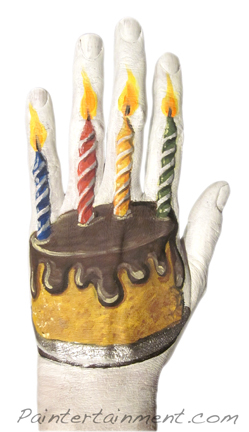 I'll let you all in on a little secret...I've been working on a new step-by-step book of really fun hand designs. It's almost ready to go to print, and will be available in the book section of my online store soon! Angry Birds were very popular new designs this year. I thought I'd take it up a notch on my own arm, since I could work on it slowly between customers, and did this full scene above. Having a little fun with some paisley print! Thought I'd try a full-body unicorn. 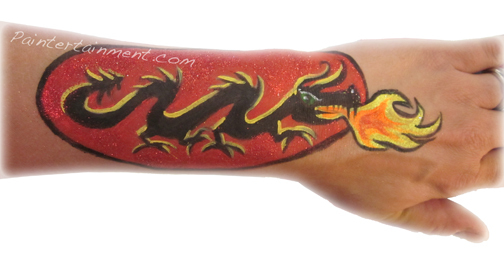 Usually I do a head/neck design on my board, but once I had this one on my arm, I did have a customer request it on hers too! 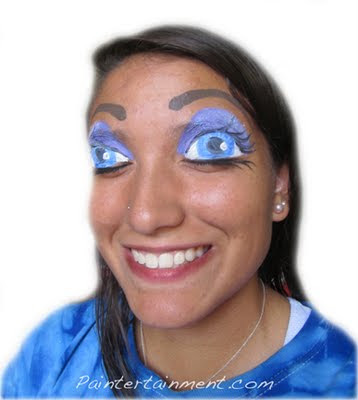 Barbie eyes...always so freaky! I had to take her photo to show her what it looks like since, for obvious reasons, you can't just look at yourself in the mirror! Many thanks to everyone who let me take their photo for my sample board! I have a big board of photos in my display and people have fun looking for themselves the following year. I always have fun seeing kids who are little on the board coming back as teenagers! I'll end the post with my cute, curly-headed little Toby. Like many of the kids who stop by my booth, he loves my big mirror stand! First "Hand Design" at the Fair! 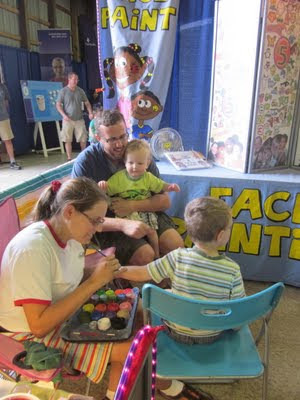 The 2011 Dakota County Fair is in full swing!! Rollie Brandt kicked off Paintertainment's 14th year yesterday in our booth just inside Exhibit Hall South (aka "Building 22"). This year we have a whole new selection of full-face designs, as well as some really fun hand designs! We haven't done any full face designs yet, but will post when we do...here's one fun hand design that Rollie did yesterday: a horse! The initials are from this horse's name. 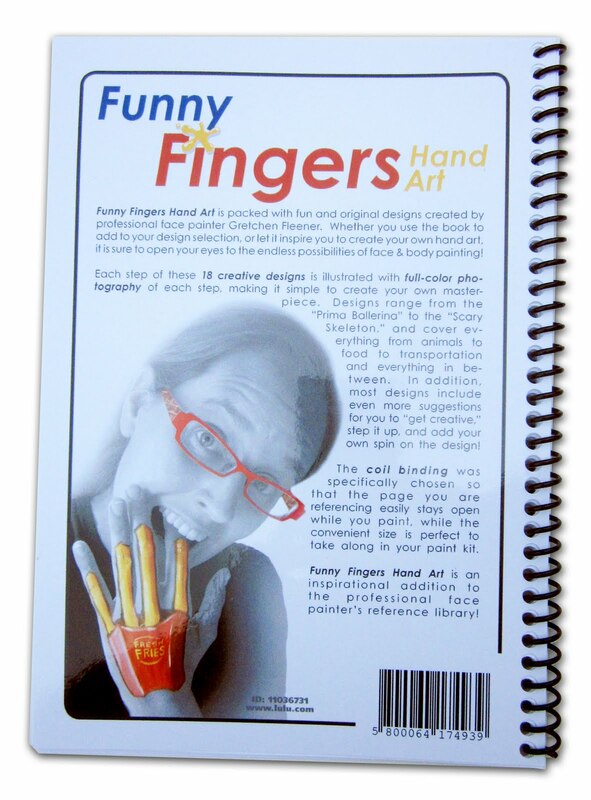 These hand designs are super fun for kids as they can turn them into little puppets and make them talk. 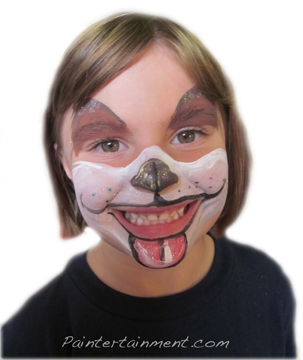 Rollie will be out there at the booth all day today, and Gretchen will be painting tomorrow. Come on out to the fair and see us...I don't think the weather has been more perfect in my 14 years at the fair! Just came across this link to some great hand paintings that were used in some Kimberly-Clark ads...fun stuff! !